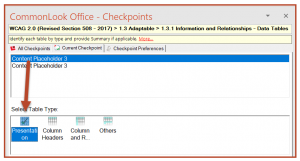 Welcome to the CommonLook Office Quick Start Guide for MS PowerPoint. This tutorial is intended to help you become familiar with the main features and primary operation of CommonLook Office. 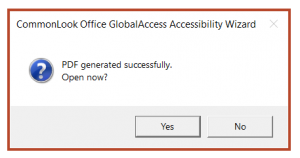 Used in conjunction with its accompanying sample presentation, this guide will take users step by step through the process of using CommonLook Office to create an accessible and compliant PDF document from the original Microsoft PowerPoint source. During the process, many accessibility issues typically found in PowerPoint presentations will be addressed and fixed. 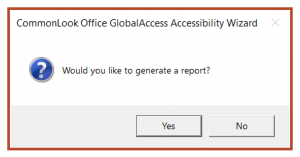 Although this guide addresses many accessibility issues common in PowerPoint presentations, it’s not meant to be an all-inclusive guide for using Microsoft PowerPoint. For more information, or to become more familiar with Microsoft PowerPoint and/or CommonLook Office, please contact your account executive or email us at info@commonlook.com. We’d be happy to discuss the various training options. 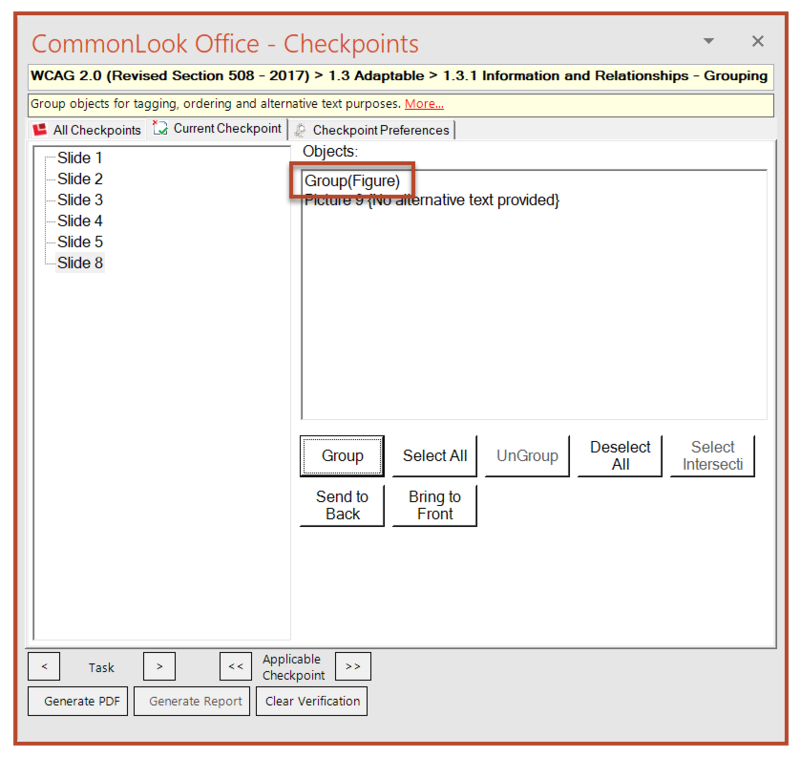 In addition, this guide assumes that CommonLook Office is properly installed and registered on your computer. If you don’t have CommonLook Office on your machine, please contact your account executive or send an email to info@commonlook.com. For help with installation or registration, send an email to support@commonlook.com. Important: In this guide, the term “CommonLook” may be used to refer to the CommonLook Office software. 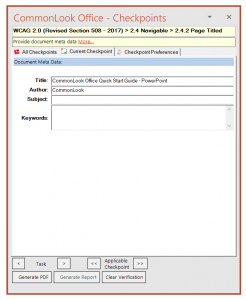 This Quick Start Tutorial uses the CommonLook Office software along with the CommonLook Office Quick Start PowerPoint. If you haven’t already done so, download the Quick Start PowerPoint. Once downloaded, we recommend you make a copy of the presentation and work on that copy. 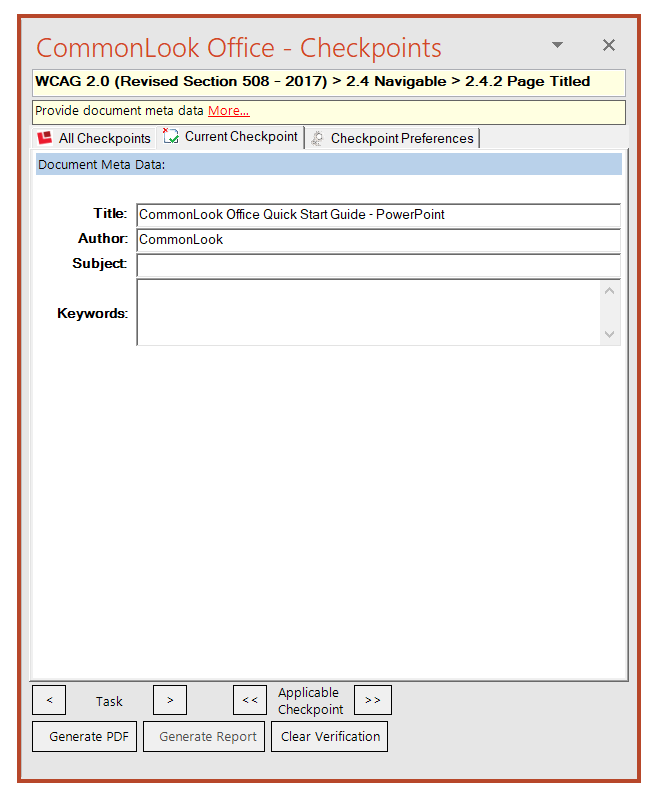 Open the working copy of the Quick Start PowerPoint (once open, you may need to Enable Editing in Microsoft PowerPoint). 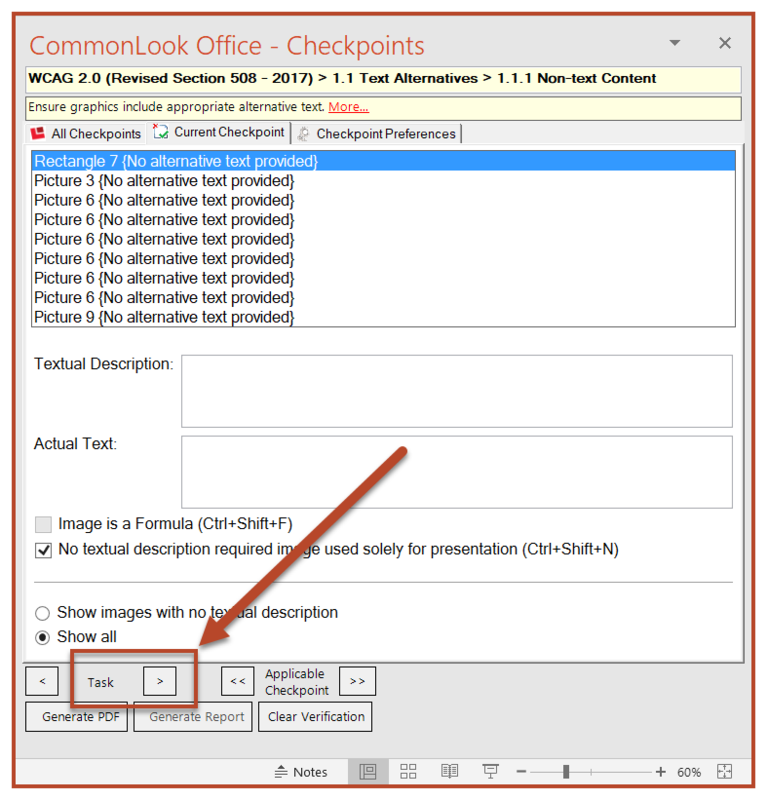 In the toolbar in PowerPoint, select the tab labeled CommonLook Office. 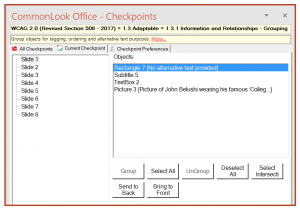 In the CommonLook Office ribbon there are various options for help and preferences. 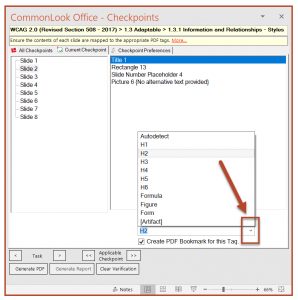 Select “Create CommonLook PDF,” to open the software. Use the OK button to continue, select “Cancel” if you don’t wish to proceed. 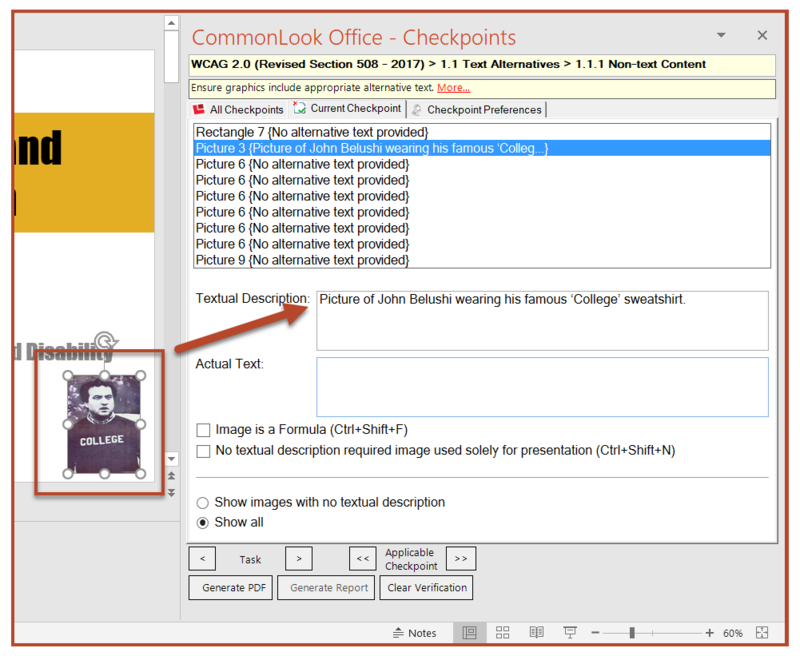 When CommonLook Office opens, the PowerPoint presentation is displayed in a panel on the left side of the screen (also referred to as the Physical View in this guide) and the checkpoints panels are on the right. 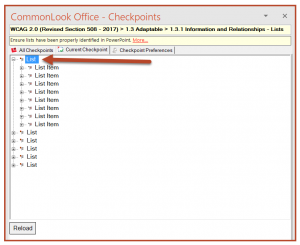 By default, CommonLook Office opens on the Current Checkpoint tab, stopping on the first checkpoint that is identified as having an issue or needing manual verification. To the left of the “Current Checkpoint” tab is the “All Checkpoints” tab. 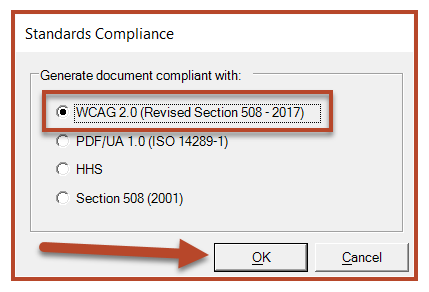 (Optional): Selecting this tab shows all of the checkpoints for the chosen standard (in this case WCAG 2.0). Not every checkpoint will be relevant for every presentation. The checkpoints that are in bold are those that either CommonLook Office has found an issue with or they require manual verification. Checkpoints that don’t present any issues will not be in bold and will also say “Not Applicable” in parentheses. Above the Checkpoints panels is a yellow box that provides the Standard and Checkpoint name along with an explanation of what the checkpoint is addressing. In addition, there’s a link labeled “More” that provides in-depth information about the checkpoint, its purpose, and instructions on how to handle it, along with where the checkpoint can be found in the various standards. Note: If you navigated to the “All Checkpoints” tab in the previous section, return to the “Current Checkpoint” tab to proceed through this guide. In the CommonLook panel, select the first image listed (Rectangle 7). In the Physical View, the golden colored rectangle behind the title on the first slide is highlighted. This rectangle by itself does not convey any relevant information. In the CommonLook Panel, below the list of images, the checkbox for “No textual description required…” is selected. In the PDF, this rectangle will be artifacted, won’t be tagged, and, as a result, screen readers and other assistive technologies won’t try to read it. Proceed to the next issue by selecting the “Next Task” button at the bottom of the Checkpoints panel. Select “Next Task.” “Picture 6” is listed a total of six times in the CommonLook panel. This graphic is the “College” picture at the lower right corner of slides 2 through 8. In this case, the use of this image on each slide is purely decorative. Just like we did for the first “image” (the gold colored background), we won’t provide a textual description, leave the checkbox checked for “No textual description required,” and all of these images will be artifacted in the resulting PDF. The last image, “Picture 9” doesn’t need to have Alternative text assigned to it either so leave the checkbox for “No textual description required…” checked. 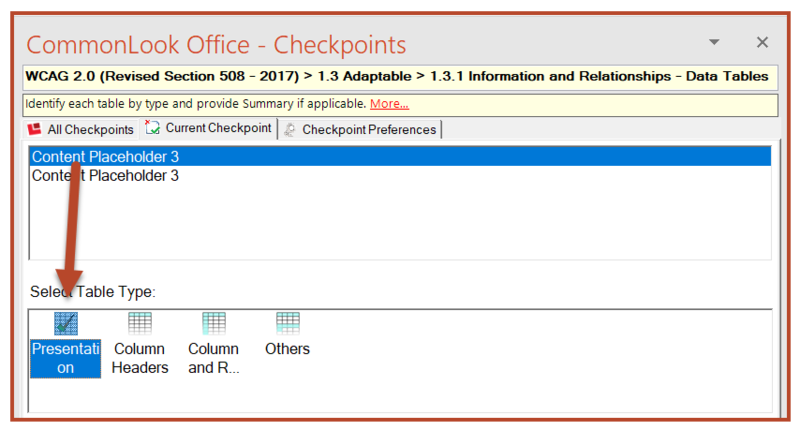 Below the Checkpoints panel, next to “Task”, select the arrow to the right of “Applicable Checkpoint” to proceed to the next checkpoint in the presentation that needs to be addressed. Remember: For more information about the Alternative Text checkpoint, or any other checkpoint, follow the “More” link in the yellow box located above the Checkpoints tabs. The next checkpoint that we come to is the Grouping checkpoint. CommonLook wants us to look at the contents of each slide to see whether or not there are multiple items that should be grouped together for the purposes of tagging, assigning correct reading order, and to provide Alternative text to multiple images that might be used to convey one common thought or concept. The CommonLook Office panel lists, on the left, all of the slides in the presentation and, on the right, all of the objects on each slide. Use “Next Task” to proceed through the list of objects on each slide, checking to see whether or not any of them need to be grouped together. (Alternatively, you can navigate through the items in the CommonLook Panels by clicking them with your mouse or using the arrow keys on your keyboard.) Hint: None of the objects on the slides need to be grouped until Slide 8. Selec first of the three question marks on the slide. If we don’t group the question marks, each one would need to have its own Alternative text. However, by grouping them into one “Figure” we can assign Alt. text to them all at once. With “WordArt5” selected (if using your keyboard to navigate, press the Spacebar to select “WordArt5), also select “WordArt6” and “WordArt7” so that all three are highlighted. Use the “Group” button below the Objects list. 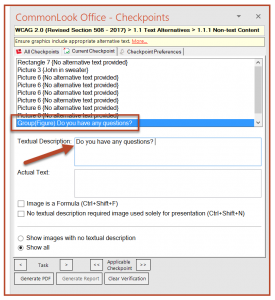 Use the “Previous Applicable Checkpoint” button to go back one checkpoint – to Images. 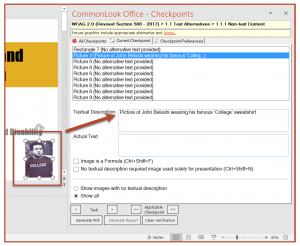 Select the Group(Figure) image in that checkpoint and provide Alternative text. Suggested Alt text could be, “Do you have any questions?”. 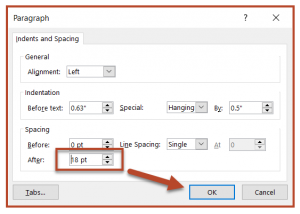 Using Heading levels correctly is very important in PDFs because Headings provide not only structural information, but they also provide a more efficient means of navigating through a document. 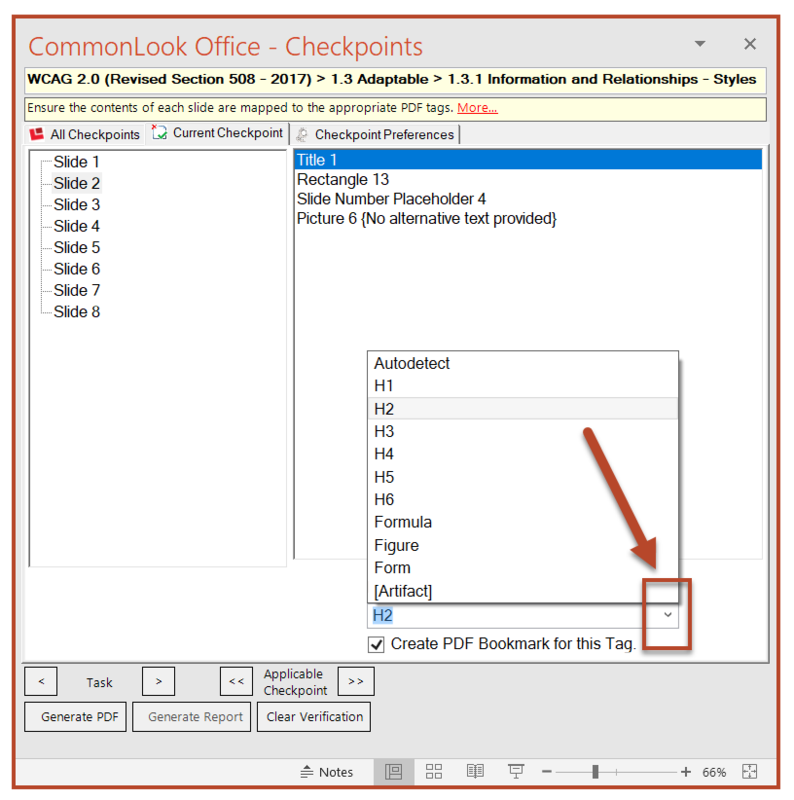 The Styles checkpoint asks you to verify that the correct PDF tag will be assigned to the content on the slides. When the checkpoint opens, each slide will be listed on a panel on the left and each object on each slide will be listed on the right. 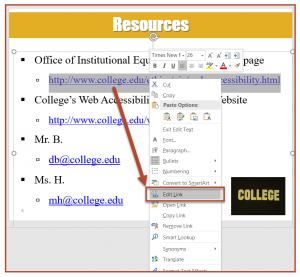 Use “Next Task” (or the arrows on your keyboard) to navigate through the objects on each slide to make sure that they will be assigned to the correct PDF tag. The screenshot below shows the second object, listed as “Title 1” selected in the CommonLook Office panel, the title box is highlighted in the Physical View, and the PDF Tag (H1) is identified below the list of objects. The first object, Rectangle 7, will be would be assigned a Figure tag in the PDF except that, in the “Images and Non-Text Content” checkpoint, we kept the checkbox checked so that it would be artifacted in the PDF. Select “Next Task” (or otherwise navigate to the next element on this slide). “Title 1,” as mentioned above, will be assigned the PDF tag of H1 (Heading 1). This is appropriate because Heading 1 is used for the title of a document. (Also note that the checkbox to “Create a PDF Bookmark for this Tag” is checked.) Proceed to the next element on the slide. The tag for “Subtitle 5” simply says “Autodetect.” This is fine. CommonLook will use the encoding in the PowerPoint to make sure that content is put into the correct tags – paragraphs, lists, etc. Proceed to the next element on the slide. Similar to “Subtitle 5,” “TextBox 2” is also marked as “Autodetect.” Proceed to the next element on the slide. The last object on the first slide, “Picture 3” will be placed in a Figure tag. The Alternative text that was assigned to this picture when we worked in the Images checkpoint is also visible. Use “Next Task” to proceed to Slide 2. The first object on the second slide is “Title 1.” This will be assigned an H2 (Heading 2). An important note about heading levels: If we think of headings like an outline, Heading 1 is reserved for the title of the document and should only be used once per document (used in the first slide). Heading 2 is used, like chapters in a book, at the beginning of major sections in a document. Heading level 3 should be used for a subsection under an H2. Similarly, H4 would be a subsection of an H3, and so on. Proceed to the next element on the slide. Continuing on, Rectangle 13, the text box containing the list, is set to “Autodetect.” Proceed to the next element on the slide. “Slide Number Placeholder 4” will be marked as an Artifact. This is correct because slide numbers (and page numbers in PDFs) don’t need to be read by assistive technology. Finally, on the second slide, “Picture 6” will be artifacted (untagged) because, in the Images checkpoint, we didn’t give it alt text. 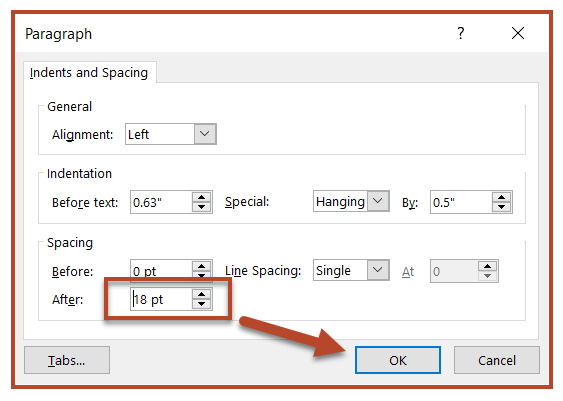 If the PDF tag is not correct for an object on a slide, use the drop-down arrow to the right of the tag window to expand the combo-box and assign it a different tag. Continue using “Next Task” to proceed through the objects on the slides, verifying that the correct PDF tags will be used. Tip: None of the PDF tags need to be changed in this sample. However, CommonLook Office takes you through the checkpoint because it’s one that requires “user verification” to make sure that the proper tag will be used. Tip: On Slides 3 through 8, CommonLook indicates that “Picture 6” will be placed in a Figure tag. However, because we didn’t assign it alt text in the Images checkpoint, it’ll be artifacted instead. After checking the objects on all of the slides, use “Next Applicable Checkpoint” to proceed. 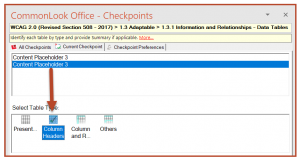 The purpose of this checkpoint to manually verify that the lists in the presentation have been constructed correctly in PowerPoint so that they’ll be tagged correctly in the PDF. Common errors that are made when creating lists in PowerPoint include not using PowerPoint’s list functionality and/or breaking what should be one list into multiple lists. 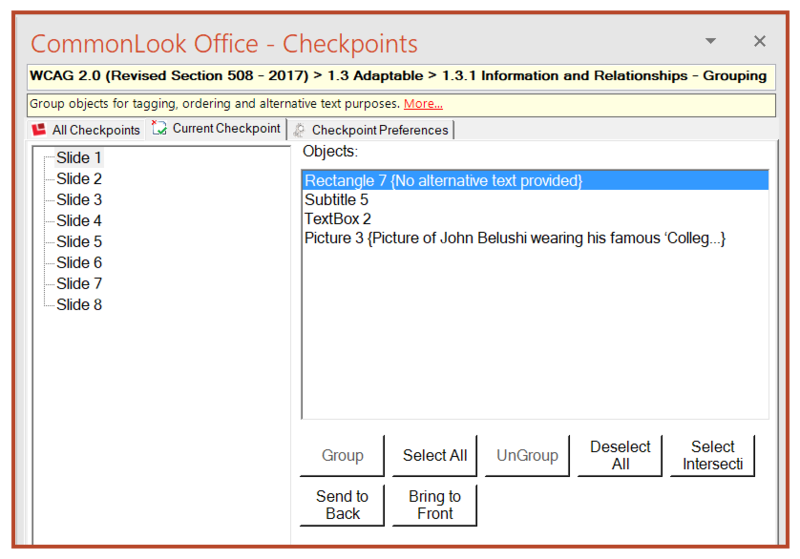 When the checkpoint opens, the CommonLook Office panel will display the lists that are in the presentation. In the CommonLook Office panel, select the first List and then expand it either by clicking on the plus (+) sign or by pressing the right-arrow on your keyboard. This will expose all of the List Items inside that List. Select each “List Item” with the mouse or the down-arrow on your keyboard to verify that the proper content is highlighted in the Physical View. Based on how it appears in the Physical View, the second slide contains a list of three items. However, in the CommonLook panel, when we select the second list, we notice that, in the Physical View, only the first two items on the slide get highlighted. To make matters worse, when we expand this list in the CommonLook panel, we find three list items inside. Selecting the first List Item highlights the correct content in the Physical View. Selecting the second List Item, however, highlights an empty space (a “carriage return”) in the Physical View. The third List Item in the CommonLook panel corresponds with the second item of text in the Physical View. In addition, if you select the next List in the CommonLook panel, you’ll notice that it contains the text of what should be the third list item in the previous list. When a screen reader encounters a List tag in the PDF, it’ll tell the user that there’s a “List of ‘x’ number of items” before reading the list’s contents. (It’ll also tell the user when the list has finished.) In this case, a screen reader will announce a list of three items, read only two items, tell someone that the first list is done, and then announce a new list of one item that should actually have been included in the first list of three items. In the PowerPoint slide, place the cursor between the first and second list items. Place the cursor after the second list item in the PowerPoint slide. In the CommonLook Office panel, below the list of lists, select the “Reload” button. This will reload the List checkpoint. Select the second List in the CommonLook panel. This should be your fixed list. 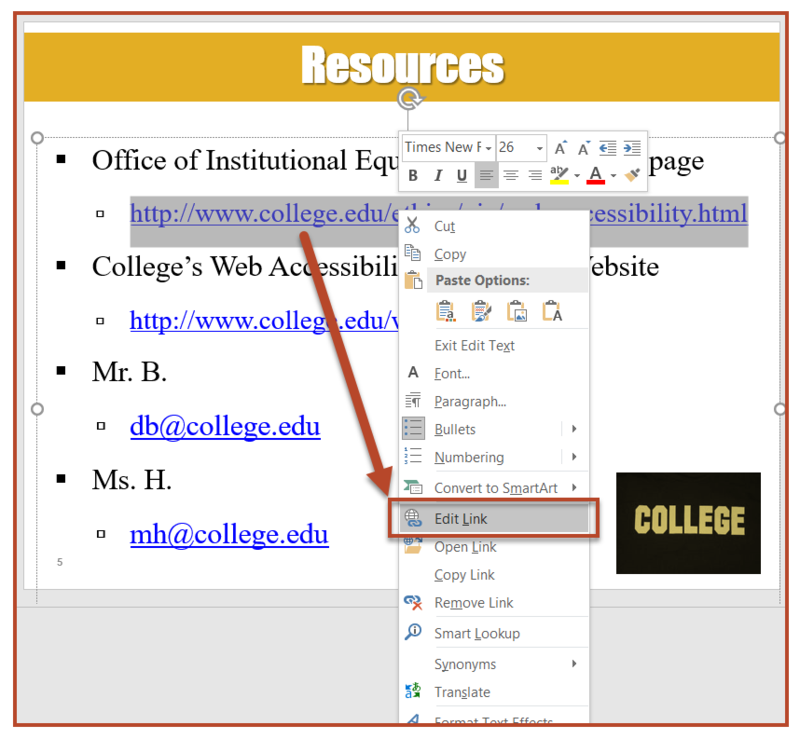 With the corrected list still selected, navigate to the “Home” tab in the PowerPoint toolbar. Use the arrow at the lower right corner of the “Paragraph” group to open up the Paragraph formatting window. Now the list has been correctly structured and the spacing between list items more closely represents the original formatting. Back in the CommonLook panel, select the third list in the Current Checkpoint panel to continue working your way through the lists. Note: Using Keyboard navigation, you’ll need to navigate to the ribbon on the CommonLook tab in PowerPoint, choose “Close and Return to PowerPoint” and then make the changes to the formatting. 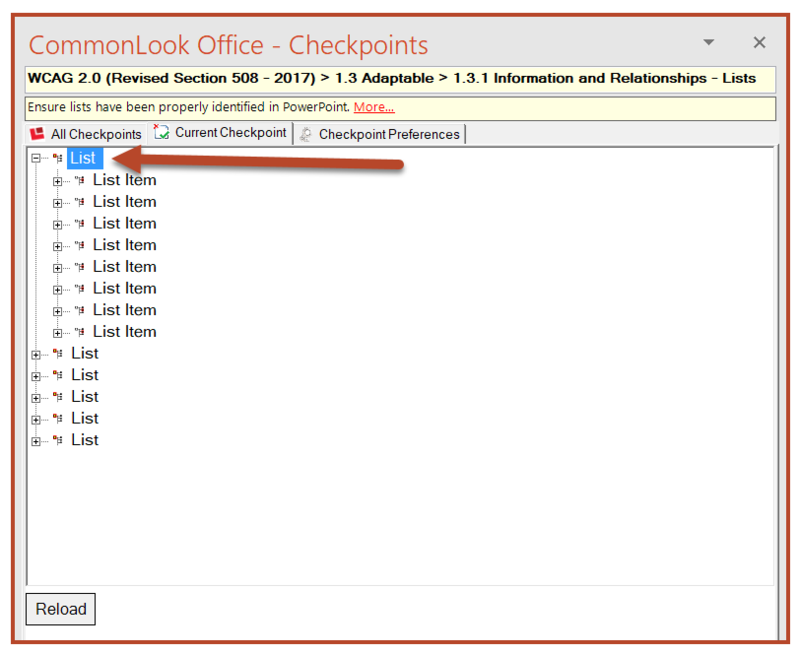 When the List formatting is fixed in PowerPoint, relaunch CommonLook Office and use the “Next Applicable Checkpoint” button to navigate back to the List checkpoint. Then, you can select the third list and verify it (the next step below). The fourth (and fifth) Lists in the CommonLook panel reveal issues similar to what we corrected before. Fix these lists so that they’ll also be tagged as one list of four items (with their nested “sub-lists” inside the “main” list items). The screenshot below shows the lists combined and the List Items are expanded to also show the “sub-lists” inside. After the List checkpoint, CommonLook Office stops on the Data Tables checkpoint. There are two tables identified in this presentation and both will need some attention. Select the first instance of “ContentPlaceholder 3” in the CommonLook panel. Use “Next Task” to proceed to the second table. 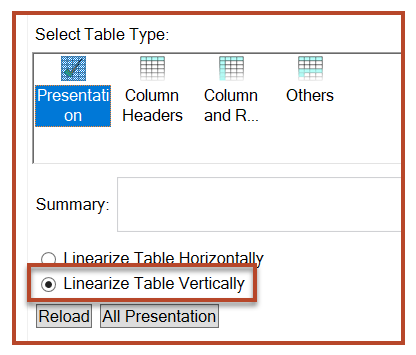 Data tables need to have their heading cells identified as either column or row headers so that screen readers can associate the data in the table with the correct header information. Unfortunately, MS PowerPoint does not provide this functionality for data tables. 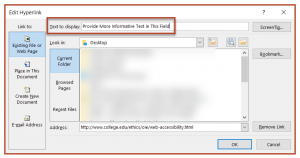 CommonLook Office, however, will allow you to correctly mark header cells so that the tables are compliant with accessibility standards. Select the second instance of “ContentPlaceholder 3” in the CommonLook panel (if it’s not already selected). Notice that this table only contains column header cells (no row headers are present). (Optional) Below the Table Type selection, provide a Summary. 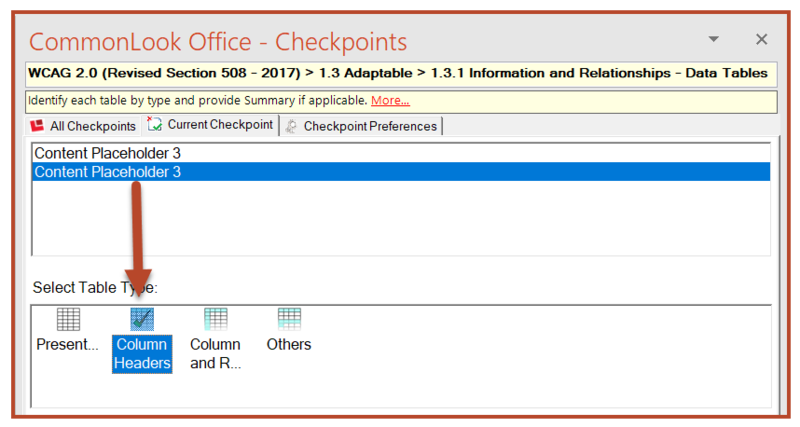 For more information on why you might include a Table Summary, follow the “More” link above the Current Checkpoint tab. Use “Next Applicable Checkpoint” to proceed to the next checkpoint. Because it’s possible in PowerPoint to place text boxes and other elements freely on the slides, it’s very important to make sure that the reading order of the elements on each slide follow a logical progression. In this checkpoint, use “Next Task” to navigate through each slide, object by object. Verify that the order in which the elements are selected is logical when compared to the visual layout of each slide. Based on the layout of the slide, the picture of John Belushi should be read last but as we navigate through the items on this slide, we find that that’s not going to be the case. Select “TextBox 2” (the last object listed). Below the CommonLook panel listing the elements on the slide, use the “Up” button to move this text box up in the reading order. In the CommonLook Office panel, below the list of slides, select the “Show Filter” button. A lens will open that can be moved around the screen to check for color issues. Move the lens, either with the mouse or the arrow keys on your keyboard, over the content on the page to make sure that, when color is removed, information isn’t lost. On the first slide, when color is removed, information isn’t lost. Press the “Esc” key or click anywhere off the filter to hide it again. Use “Next Task” to check the other slides in the presentation. Use “Next Applicable Checkpoint” after Slide 8. Title – (Required by all standards) This should be short but informative to the purpose of the document. Author – This is not an individual person’s name. Use the name of your organization, department, agency, division, etc. Subject – Sometimes the same as the title. May provide a brief description of the document. Keywords – Keywords make the document searchable online. Separate keywords with semicolons. When finished inputting the metadata information, choose “Next Applicable Checkpoint” to continue. There are two checkpoints to address links. They’re described next. 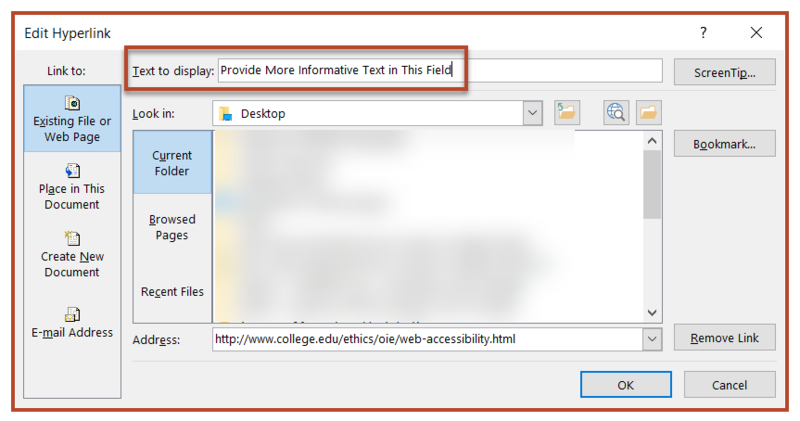 Similar to images and “non-text” content, hyperlinks should also have Alternative text that tells people using assistive technologies where the link will take them (or what it’ll do, for example, opening an email to compose). This checkpoint allows you to describe the link in a meaningful way. In the sample presentation, there are four links that will need to be addressed. In the CommonLook Office panel for this checkpoint, select the first hyperlink listed. Use “Next Task” to proceed to the second link. Close CommonLook Office and return to PowerPoint (with the button in the ribbon). Select the link text and right-click on it (open its context menu). When the “Edit Hyperlink” window opens, enter appropriate text into the “Text to display” field. Select “OK” at the lower right corner of the Edit Hyperlink window. 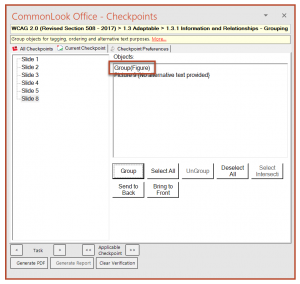 Save your changes and then reopen CommonLook Office to continue through the other checkpoints. Tip: When reopening CommonLook Office, it’ll stop on the Images checkpoint again because this is one (of many) checkpoint(s) that require user verification. Use the “Next Applicable Checkpoint” button to fast-forward to where you left off. Similar to the “Meaningful Sequence” checkpoint, because it’s possible in PowerPoint to place text boxes and other elements freely on the slides, it’s very important to make sure that relevant content doesn’t get covered up. In this checkpoint, CommonLook Office lists the elements in the presentation that overlap other elements. Use “Next Task” (or the down-arrow on your keyboard) to move through the list of objects, making sure that one element doesn’t hide any content in another. If any content is hidden, close CommonLook Office, return to PowerPoint and reformat the slide so that information isn’t obstructed. In this sample presentation, no obstruction occurs so, at the end of the list of objects, use “Next Applicable Checkpoint” and move on. 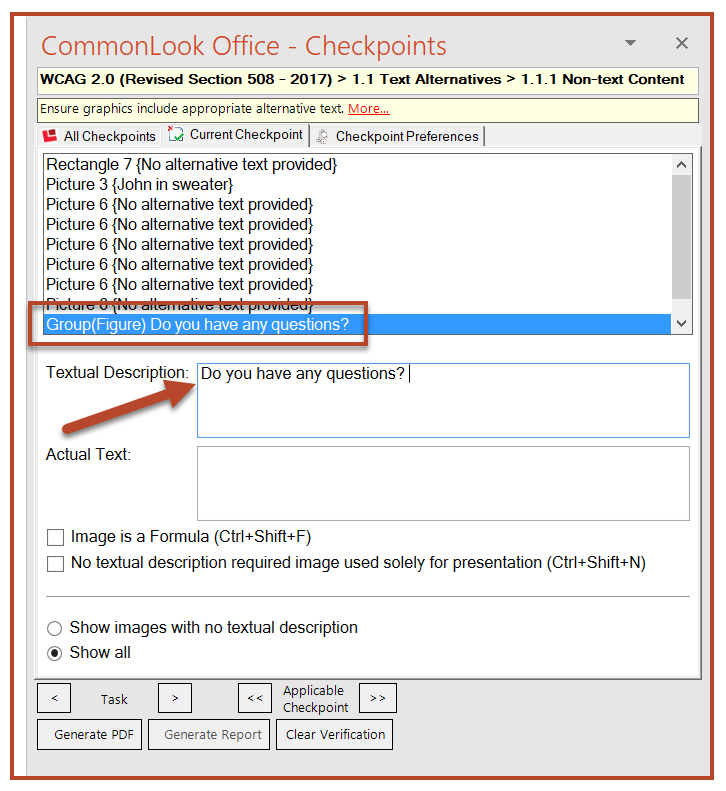 If you choose “Yes” CommonLook will start again at the beginning, taking you through all of the relevant checkpoints in the presentation. Tip: This can be helpful if, for example, you grouped your images but then didn’t go back to the Images checkpoint to give them Alt text. 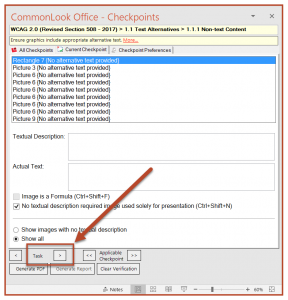 CommonLook will stop on the Images checkpoint again making it easy to provide Alt text. If you choose “No” CommonLook will move to the next step which is to create the PDF. Once we’ve made our way through the checkpoints, verifying and/or fixing things as needed, we’re ready to generate the accessible standard-compliant PDF. 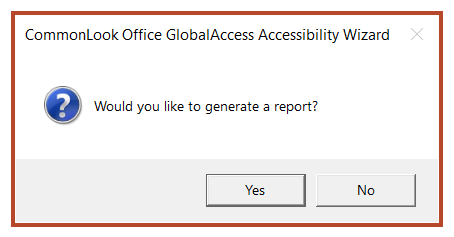 After the PDF has been created, CommonLook Office will ask if you want to generate a compliance report. If you choose “Yes,” in the “Save As” window, give it a name and then choose “Save.” The report will be saved as an accessible HTML file. 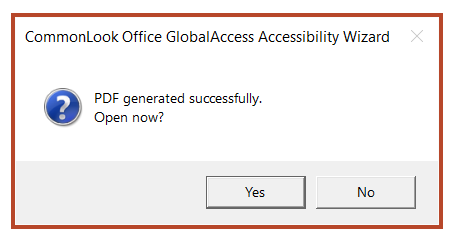 CommonLook will also ask you if you want to open the PDF. Choose “Yes” or “No” as needed. 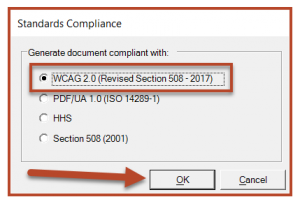 Congratulations, you’ve generated an accessible WCAG 2.0 compliant PDF from PowerPoint using CommonLook Office! We hope that this Quick Start Guide has been a helpful resource in getting started using the software. For more tips, help, and information, please visit the CommonLook website. For information about training in CommonLook Office, please visit our Training page, email your account executive, or contact us at info@commonlook.com. We wish you continued success in your creation of accessible and standard-compliant PDFs!